While I mainly wanted to update the photos only for this post, I must bring to your attention that I tried using soda bicarbonate instead of Eno as many followers complained that its not readily available in places they live. However, the brown specks kept on appearing. Finally found the solution, do not add turmeric powder if you’re using soda bicarbonate. A bit of chemistry lesson here. Turmeric contains curcumin. This chemical turns red when it reacts with bases and yellow when it reacts with acids. Soda bicarbonate or baking soda is a base. So when curcumin when it comes in contact with soda bicarbonate it turns red, thus the brownish specks. When it reacts with acid present in water or other sour yogurt, lemon it turns yellow. My niece Krishna is now a grown up beautiful woman, getting married next year. I didn’t delete any part of the post as my blog also acts as my diary full of memories and experiences. Soft and spongy, dhokras or dhoklas is a famous Gujarati snack, usually made with chickpea lentils and rice which are soaked overnight, ground to a paste and then steamed. Or dhokra flour is soaked overnight in warm water and sour yogurt. Its my all time favorite and I can manage to finish a whole plate by myself! However, what do you do when someone wants dhokras for snack and you don’t have any soaked rice and lentils ready or dhokra flour? You make instant dhokras like the way my sister Sapna does. Her daughter Krishna, loves dhokras especially for breakfast on Sundays. No one can wake her up early on Sundays even though we would make a lot of noise, but the moment she gets a whiff of dhokras steaming, Krishna would be up in a jiffy ready to have her dhokra breakfast. I learnt how to make instant dhokras from my little sister. Have made a slight change to the recipe. If guests call that they are popping in sometime, this dish can be cooked up in a jiffy. I have made instant dokhras umpteen of times for Nami’s friends as they all loved them. It’s a fail proof recipe and very easy to make. Mix all the ingredients for dhokra except the red chilli powder and eno. Mix it very well till there are no lumps left. Put some water to boil in a dhokra steamer or a wide pan. If you are using a wide pan, fill it with water quarter of the way. Put a small steel bowl or ring in it. This will act as a stand for your plate and keep the water out of the dhokra mixture. Grease two 8 inch aluminium or steel plates with a rim or one 12 inch plate. Put it in the pan while the water gets ready. This helps to warm the plate and at the same time you have checked whether the plate will fit in the pan or not. If you are using 2 plates, divide the batter into two. When the water is boiling, add ½ tsp eno to one part of the batter. Whip the mixture very well. It should become fluffy. Add the mixture to the warm plate in the pan. Sprinkle half of the red chilli powder all over it. Cover the pan and steam the dokhras for 10 minutes. When the first tray gets done, remove it from the pan. Add more water if required. Repeat step 6 and 7 with the remaining batter. To prepare the tempering, heat the oil in a small pan. Add the mustard, sesame seeds, asafoetida, curry leaves, coriander and chillis. Let it fry for 30 seconds or so and switch off the heat. Spread the tempered mixture over both the plates of dokhras. Let the dhokra cool down for 5 to 10 minutes before you cut them into squares. Serve with fresh coriander chutney or with garlic chutney. If the dhokras become cold, warm them up in a microwave oven or steam them again for 5 minutes. If you have time, then leave the batter for 10 to 15 minutes before you make the dhokras.This will help the semolina to become soft. Can use just chickpea flour instead of semolina. That’s the slight change I have made. If you want to serve dhokras later, cut them into squares or diamond shape. Heat oil and add all the tempering (vaghar) ingredients. Then add the dhokra pieces. Stir fry till they become hot. Serve. This is how its usually served if we prepare dhokra as a part of a thali meal. I was too tempted to cook this when I woke up reading this in my inbox. I didn't have asafoetida and I made it without the vaghar. Tasted yummy with ketchup! Quick and easy way! Hi Darla thanks for trying out the recipe. Glad you enjoyed it. My cousins too love dokhra with ketchup. Looks so tempting and instant method is good when you have guest at home. So we replace ENO with same quantity of soda? I am not a big fan of eno and next time I make dhokla want to replace it with soda. Yes Usha replace it with same amount of baking soda and whip the batter well till it melts. And remember do not add any turmeric powder. I love instant recipes than the elaborate ones. These dokras look so yum and that is a wonderful pointer on mixing baking soda and turmeric. Never knew about that. Yes Gayathri after so many trials and errors and research. Dhokla turns out great! Nice color and open porous texture. Instant dhokra rocks, how prefect and porous it looks. Definitely this dish will please my tastebuds. My kind of food. Thanks Rafeeda, those red specks are chili powder. My favourite snack.. The dhoklas have come out so soft and spongy. Lovely instant Dhoklas , even I make with sooji , but I like these , besan will add lot of flavor to these . I made these just yesterday for my dinner , and thoroughly enjoyed them . Thank you so much Vaishali. thanks for trying out the recipe and glad you enjoyed them. Me a chemistry graduate could not put 2 n 2 together. Thanks for the pointer Mayuri. I can’t make instant dhokla. Mess it up but will try your recipe n update you. I probably too would not have thought of it if it were not these queries from my followers. This recipe is easy. Try it Archana. I am drooling over the pretty looking piece of instant dhokra Mayuri. Thanks for this easy and quick recipe. I will try it soon. Lovely click. Thanks Sujata. Please do try the recipe. Didn’t realise you have been blogging since 2012. Those dhoklas are look fantastic. Those chemistry pointers are simply too good. I love chemistry and always look for the reason when making a dish! Thanks Srivalli, that’s why I need to redo so many posts. I was awful at taking photos. Instant dhokra looks so perfect,Mayuri. I have made dhokla with besan and semolina separately, but never combined them so far, will give it a try on your version. Yep, you’re right about the soda, as a kid, we used to make red color with turmeric & laundry soap and always wondered about the red color when those two things are mixed. Wow, Sandhiya that must have been fun mixing laundry soap and turmeric. Try the combination of besan and sooji, you’ll like the dhokras. The dokra is a wonderful recipe and it looks so fluffy. I am sure to try this. Thanks Seema. Please try it. Interesting science lesson there. I have always used ENO, so I have never had to ponder on the specks 🙂 The dhokla looks so authentic and beautiful. Thanks Harini. I too use Eno, but some remote places in UK, US and Canada Eno is not available. These dokhlas look so soft and spongy…you have nailed the texture! Lovely clicks too! Thanks Poonam. Remember Mallika tried it out with baking soda and they came out good. Thanks Pavani, my niece still loves them. wow ur a great cook! love the pics………….so tempting! Thanks Freda and definitely a quick recipe to take care of dhokra cravings. 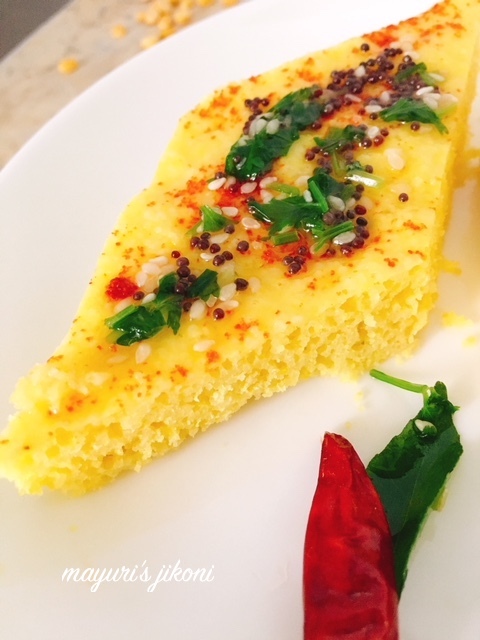 This is my go to dhokla recipe and I always make it only. So easy and super simple to make. Thanks Sapana..yes its easy and quick. Mireille try this recipe, its so easy. Can enjoy them hot with a bit of olive oil too without the tempering. Lovely redo… looks so inviting.